In this 24 week advanced class students will encounter actual living situations taken from my files. They will study each case, attempting to determine the character of the person and the nature of their circumstances at a particular time in their life. Emphasis is on testing one’s astrological capacity and on refining one’s perspective. The challenge is understanding character in time. Using the transit graph students attempt to asses the character and circumstances of each chart and present what advice they would give the person. A wide spectrum of situations are used giving the students some scope to develop, and a sense of what real life and real needs are about. Interpretations are guided but the students are participating in the interpretation. The emphasis is to stretch and train the student to perceive correctly and learn to give healing and helpful advice. The responsibility for any conclusions made or any advice given is highly accentuated. Students give their opinion of what is happening in the persons life and how they will help them, before they are told what is actually going on, and what advice was actually given. An effort is always made to integrate the crisis times with the nature or character of the nativity. 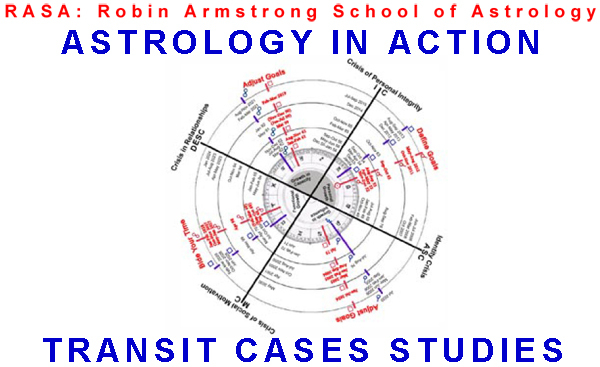 Students learn to think for themselves and gain confidence in their use of astrological deduction. The distinction between projecting into a chart, and perceiving what is actually going on, becomes apparent. The test of a good astrologer is to interpret the chart according to the person’s actual values and needs, rather than his or her own.